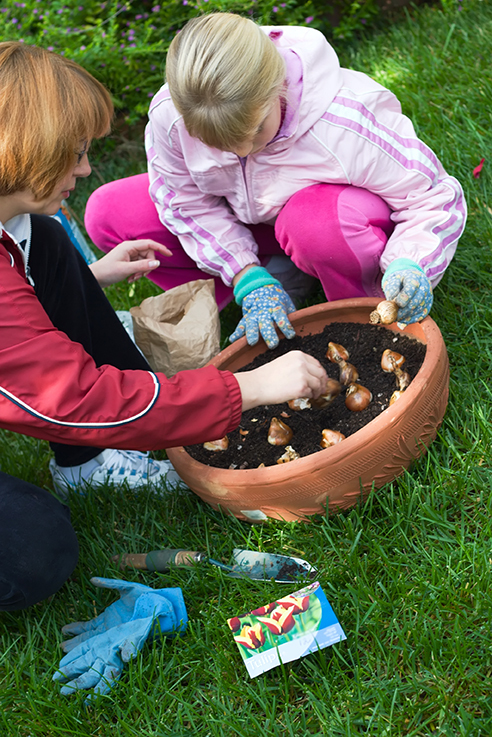 Involving your kids in gardening is a fun way to keep them entertained while you get the real work done. It also gives them a lifelong love and respect for this rewarding pastime. No matter what size garden you have, whether it’s just a few pots by the door or an acre, gardening is an activity that brings a whole host of benefits that you can share with your child. It is exercise and fresh air, it’s relaxing, and you’re rewarded with beautiful flowers, shrubs, trees, fruits, vegetables and herbs. What a great skill to pass onto your children! Here are some ideas and tips for you to try in the garden with your children, ages just two and up. Section off a small corner of the garden or dedicate a large planter that is just for your child to plant in. This ownership will make gardening exciting for them and they will enjoy watching what they planted themselves grow. Planting a tree will only take about 30 minutes, so this isn’t a great one for keeping the tots busy, but the enjoyment of watching the tree grow is about as long-term as it gets. When your child is grown up, they will get to look up at this beautiful towering tree with a sense of pride. For extra fun points, plant your tree from a seed your child has found themselves - an acorn from an oak tree, a conker from a chestnut tree or a helicopter from a sycamore. This how-to guide from the BBC has all the step-by-step instructions you will need. A creative outdoor activity for when the rain subsides, building a scarecrow is as much fun as building a snowman with the added bonus of protecting your beloved crops. Just a little help from a grown up to get started and source some unwanted old clothes, and your little ones can spend hours on the finishing touches. So far, we’ve been all about keeping the kids happy and entertained, mostly to buy you some time in the garden, but there are tasks that the kids can actually help you with. They’ll also get a kick out of knowing they’re helping and doing what they’ve seen you do. Weeding - once your child is old enough to be shown how to recognise a weed, this is a nice little job for them to help you with. Of course, make sure they are not working near any thorny or stinging growth and that they have gardening gloves to protect their little hands. Watering - during the hot summer months, your beds, pots and baskets will need extra water and kids will love this job using a child’s watering can. Raking - with a lightweight and safe rake, your child will enjoy raking up your leaves and cuttings and piling them into a wheelbarrow. Deadheading - again, once your child is old enough to be taught how to recognise a deadhead and how to correctly remove it, this is a job they will absolutely love! Picking ripe fruit and vegetables - as well as being helpful to you, this is a great way of demonstrating to them how productive gardening can be. Looking after the birds - give your child the responsibility of keeping the bird feeder topped up and the bird bath filled with fresh water. Remember, a lot of plants, particularly their seeds, can be toxic if ingested or even if they come into contact with the mouth at all by way of the hand for example. It is important to teach children to wash their hands before eating or touching their face and mouth after handling plants, earth and seeds. It is also important to wash any fruit, vegetables or herbs you grow before eating them in case they have come into contact with other toxic plants or pesticides.